May 20th will be the release of the movie Bloodworth, starring Kris Kristofferson, Dwight Yoakam, Hilary Duff, and Val Kilmer. The movie is based off the novel Provinces of Night by William Gay, and originally the movie was going to have the same name. With such a high caliber country cast, you can be sure music with be integral to the film, and it includes compositions by T Bone Burnett, and “You Don’t Tell Me What to Do”, an original song from Kristofferson. 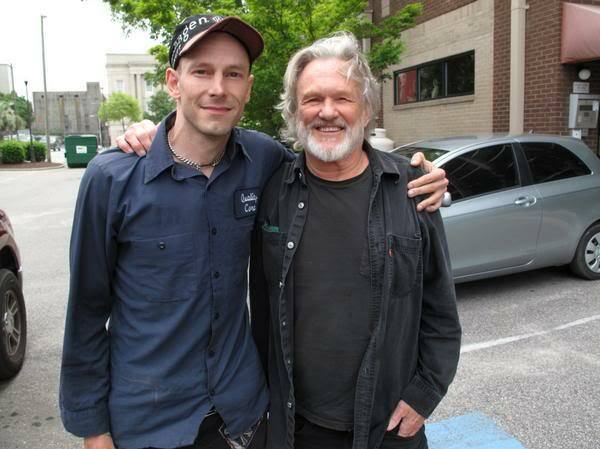 E.F. Bloodworth (Kris Kristofferson) has returned to his home – a forgotten corner of Tennessee – after forty years of roaming. The wife he walked out on has withered and faded, his three sons (Dwight Yoakam, Val Kilmer, & W. Earl Brown) are grown and angry. Warren is a womanizing alcoholic, Boyd is driven by jealousy to hunt down his wife and her lover, and Brady puts hexes on his enemies from his mamma’s porch. Only Fleming (Reece Daniel Thompson), the old man’s grandson, treats him with the respect his age commands, and sees past all the hatred to realize the way it can poison a man’s soul. It is ultimately the love of Raven Lee (Hilary Duff), a sloe-eyed beauty from another town, that gives Fleming the courage to reject this family curse. Keep your eyes peeled for an upcoming in-depth interview with JB Beverley from Misfit Radio, including the scoop about his Bloodworth song. Hell yes!!! I can not wait to see this movie. Its been a long time coming. I am also looking forward to the Interview with JB. I hung out with JB last night. He is a great songwriter and musician that i think doesn’t get enough credit and the credit that he deserves. Did JB happen to tell you when we might expect a new release? No, I didn’t even think to ask . Maybe Misfit Radios interview will have some insight to when we might see some new material released. this is gonna be great! Shelton has a very nice role in this film. Great cast and story line. Im glad it is finally seeing the light of day! This looks quite fabulous! Can’t wait to see it. This might be a dumb question,but is it coming out to theatres? or just select theatres? Or is it a straight-to-DVD release? That looks great. How cool that Hank III is in it too? As he’s aged Kris Kristofferson has morphed into Kenny Rogers and Kenny Rogers has morphed into Joan Rivers. That’s funny! Am I the only one who thinks that’s a great photo of them? (Shelton and Kris) I wonder when it was taken? Agreed! Shelton looks so young all clean-shaven like that. Actually, I thought it was Jeff Bridges at first. Looks like a great movie. Usually I dont wait in line to see a movie opening night, but this looks like a winner. NICE… W. Earl Brown wrote the film. I LOVE him. I sent him and his wife a t shirt and a hat and he wrote me back that he has an above averge, bigger than on the big side, head. I am excited to see what he is doin’, I haven’t kept up since he was workin Deadwood. Hope this gets to theaters in Holland, otherwise I’ll have to wait for the dvd. I mean, Jeff Bridges wasn’t too bad looking like Kris Kristofferson in Crazy Heart, but this is the real Kris, acting someone else. Already interesting. And Dwight, a bit of Hank, some good music…. can’t wait. Geez I’d watch it just for Kris and Val but III in it too? Woo Hoo!